Pick a map. Any map. Okay, make it a map of the United States. Find the West Coast, and press your little finger into the black dot called "San Francisco." Now trace your finger north along the jagged edge of the coast as it goes up, up, up to the very tip of California. That's us. 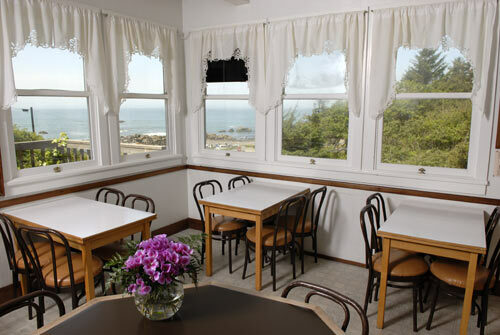 "Us" is the Redwood Hostel, a renovated pioneer homestead sitting along the highway, just across the street from the rocky shoreline of the Pacific Ocean. The hostel has been running for more than 21 years, ever since the folks at Redwood National and State Parks got together with the folks at Hostelling International USA and decided to make a hostel. With plenty of help from other organizations, in a few years they converted "the old, boarded-up DeMartin house" into a cozy little hostel by the sea. 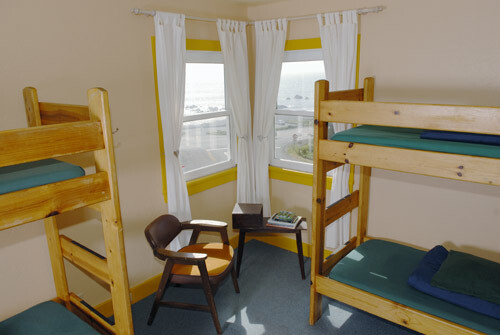 The Redwood Hostel is part of Hostelling International. Imagine HI is a Russian doll. Open up your smiling Russian HI doll (pretend she's in a purple dress) and inside you'll find an all-dressed-in-green doll representing HI-USA. Open HI-USA and inside awaits the HI-USA Golden Gate Council, dressed in her best red frock. Open up the Golden Gate Council, and there we are: the littlest doll of all. More than 4,000 hostels belong to HI, so if you like, imagine 4,000 Russian dolls dancing across the globe, each with their own story. But this story is ours. 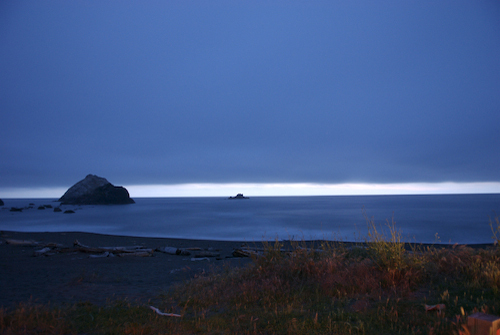 Our council is headquartered in San Francisco, a full seven hours' drive from the hostel. 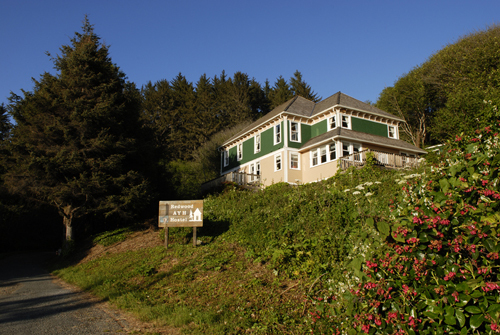 Yet even at such a distance, the Golden Gate Council has been the lifeline that financially and administratively keeps the Redwood Hostel alive and well. Thirty people can sleep here, and most summer nights that many do. 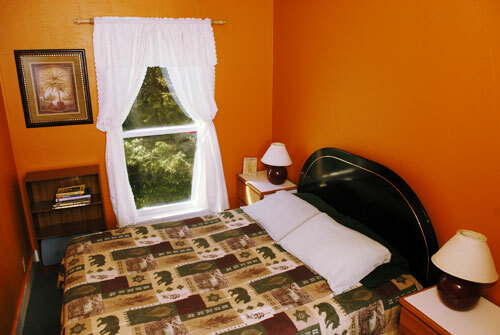 The rest of the year, though, between 14 and 24 hostellers nightly find their way into one of our four dormitories or two private rooms. The hostel has a large common room with a pellet stove, as well as three bathrooms, three showers, a laundry room with washer and dryer, a dining room, and a large kitchen. Some hostels may skimp on the kitchen supplies, but in our rural locale (with a 25-minute mountainous drive between us and the nearest supermarket) we need to ensure that more than just the basics are met: two stoves, toaster, blender, food dehydrator, food processor, dishware, cutlery, pots and pans, big sinks for dishwashing, two refrigerators, a freezer, cabinets to store dry foods, assorted cookbooks, organic/fair trade coffee, bagged and loose-leaf tea, cooking oil, free pancake mix and syrup, and shelves of seasonings. There's even a few "Free Food Shelves" for people to leave their extra food for the next hungry guest to enjoy. The best amenity, however, is the view. From most rooms you can watch the sun rise and set over the ocean. Our hostellers come from the United States, Europe, Japan, Australia and occasionally—if we're lucky—from someplace else in the world (that's when the real intermingling of cultures can occur). But no matter where they've come from, they have all come to see the redwood trees, the tallest living things on earth. 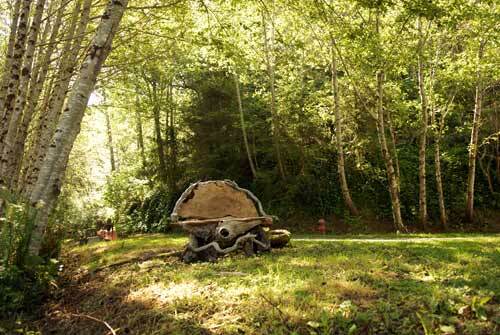 Redwoods can grow 350 feet tall or more. The reigning "Giant of the Giants" was around 380 feet tall the last time the scientists checked, and that tree lives in an undisclosed location down the road. Walk into an old-growth redwood forest, with its rain-dropped ferns and octopus limbs, and climb over a fallen tree that crashed to the earth 1,500 years ago. Then you'll get it. You'll understand why people travel so far to see them and why, sometimes, they will even climb a redwood tree and live there for years to stop a timber company from chopping it down. Redwoods like rain. Lots of it. The land becomes polka-dotted with puddles every winter and the travelers mostly stay away. We limit the hostel's hours during wintertime, opening for the weekends and holidays only from November through February. And then on March 1, we have a go at another season and are open daily until October 31, the American holiday of Halloween. Because the hostel is tucked into a cove, hemmed in by mountains and a seven-hour drive from the nearest metropolitan area, it's no surprise that high-speed technology hasn't sped its way here. 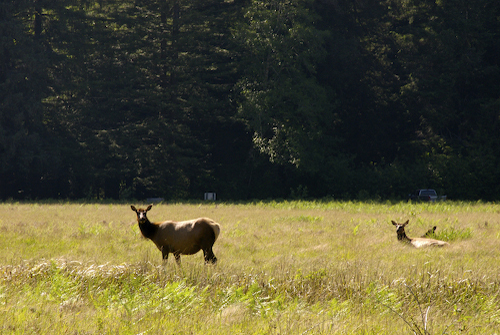 There is no cell phone service, no guest Internet access and no cable TV. Our lack of tech amenities sometimes aggravates the new arrivals, who are certain that life will end if they can't check their email this very instant. But soon thereafter, they begin to appreciate the technological detox. Without the usual distractions, they gravitate towards conversations with other hostellers, reading books from the library, playing board games, picking up a guitar or one of our other many musical instruments, or perhaps they just sit outside on the deck and listen to the sea. The favorite activity around here is a four-letter word: h-i-k-e. There are short loop trails, long backpacker trails, trails along the ocean bluffs, and trails edging the jade-green rivers. There are popular trails that take you near the secret locations where Star Wars: Return of the Jedi and E.T.were filmed. Other trails grow so wild that you must crawl under fallen branches and over downed trees, or bushwhack your way through the weeds. 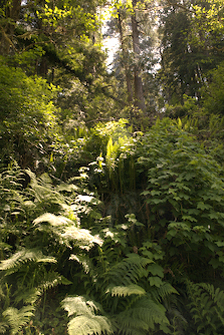 The aptly named "Damnation Creek" trail descends 1,000 feet and was used for centuries by the Tolowa Indians, while the "Stout Grove" trail is a gentle, wheelchair-accessible loop of old-growth giants. The Coastal Trail, running from Canada to Mexico, cuts right through the hostel grounds. 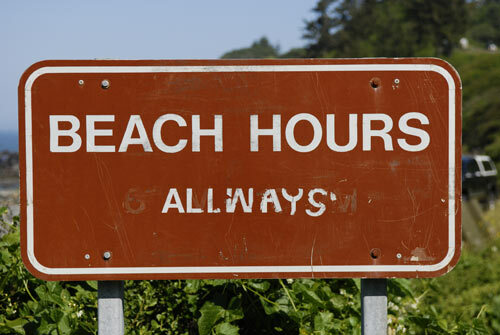 Take the trail south to a hidden beach. 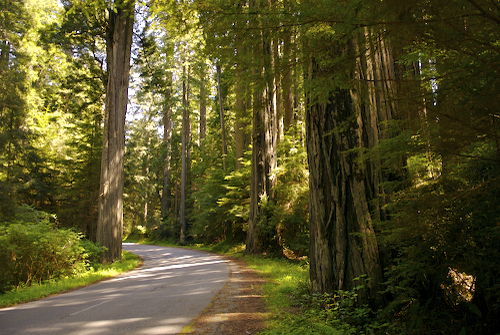 Take it north into the Redwood forest. 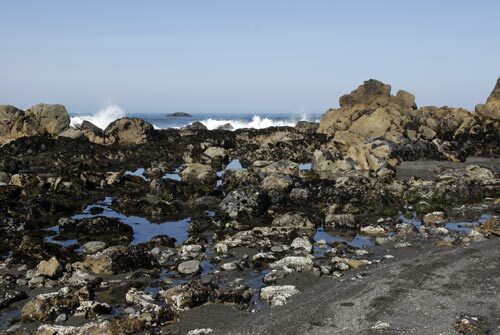 Or simply walk across the street to False Klamath Cove and find where the rushing Wilson Creek waters meet the ocean. 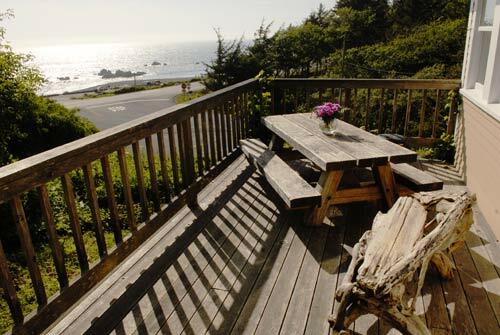 Beyond hiking, the beautiful region offers kayaking, surfing, rock climbing, whale watching and fishing, as well as theatre, yoga, music, dancing, dining and a summertime old-fashioned Drive-In theatre in nearby Crescent City (13 miles north of the hostel). The hostel has a small offering of activities to keep folks busy, such as Full Moon Hikes and Documentary Fridays (we break our anti-TV culture once a week and show documentaries). We've also hosted an Amnesty International write-a-thon and will soon offer an ecological scavenger hunt and conduct monthly seabird tallies to help scientists assess the affects of oil spills. We have also hosted a Community Walls event (which is part of the council-wide Hostel Adventure program), which was a collaborative program with a local school comprised mainly of young Yurok Indian tribal members. We invited the students to create a mural on canvas that answered the question, "Who is Your Community?" The result is a stunning mural that now hangs in our common room, depicting not only the colonization of their land and their culture, but also their will to endure as a people and a culture. In the center of the mural they painted "Korek," the Yurok expression that means "I Survive." Community Walls mural made by Yurok youth. 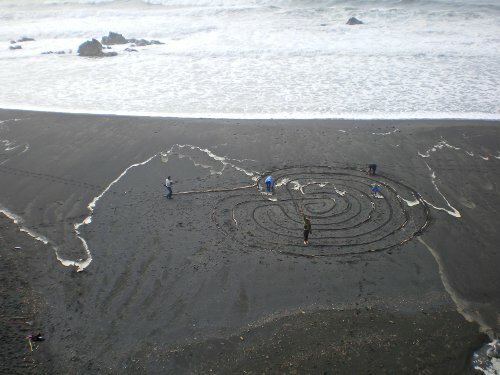 Recently, our skilled staff also offered a workshop in building and playing didgeridoos, and a few weeks later we built a labyrinth on the beach to celebrate the 50th anniversary of the Golden Gate Council (1958-2008). 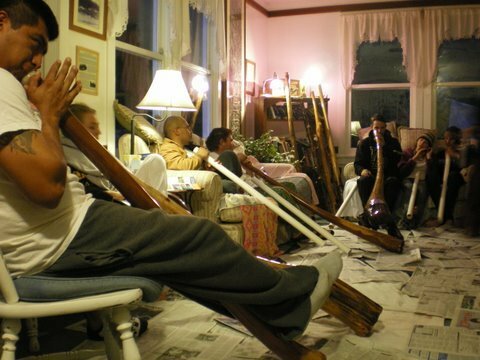 A didgeridoo workshop led by hostel staff. Halloween at the hostel. This traveler, Roei Sadan, is on a journey to become the first Israeli to bicycle around the world. 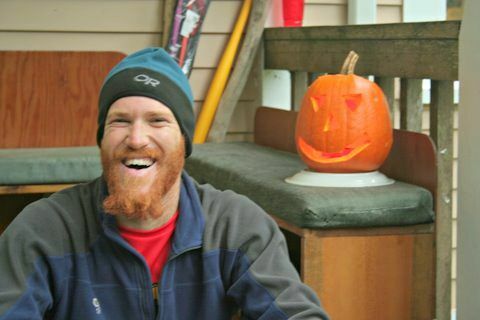 He had never experienced Halloween and volunteered to carve our Jack O’ Lantern. Later, we took him to a local Halloween costume party for the full immersion in an American Halloween! 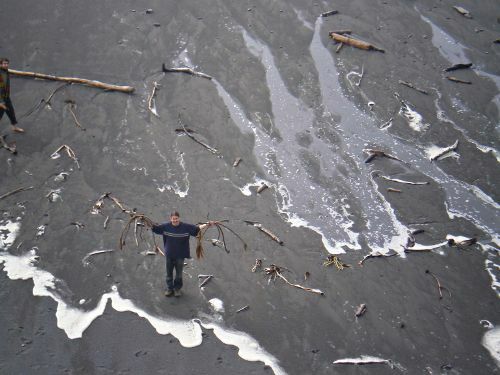 Our staff swells and recedes like the nearby tide. For starters, there is the manager. I'm Kaci, the manager since 2006 and I live here with my husband, Ryan (who effectively is my "co-manager") and our young son, Rory. 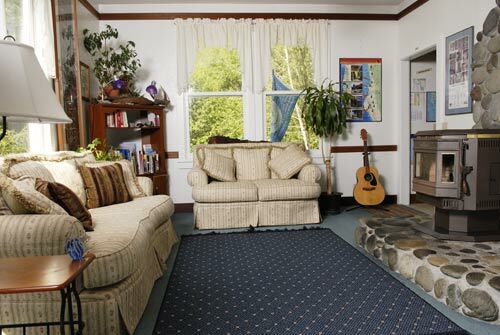 We live upstairs in private living quarters complete with kitchen, bath, and bedrooms. When we're open daily, we hire 2-3 extra staff. They help register guests, answer plenty of questions, and clean, which is obviously helpful. But we most appreciate them for their talents. Regarding our present and former staff, Cautepishaun makes Yurok Indian jewelry, Lezlie is a photographer, Tara caters parties and studies midwifery, and Mark performs his own rap songs. Andrew and Emily build and play didgeridoos, and also know herbal healing. Barb is an all-around healer and listens carefully to hostellers. Yet when the November winds roll in, our seasonal staff hours disappear except for occasional extra help during the holidays, and once again we're alone. Because even when it's just Ryan and myself at the hostel, way down in San Francisco are the brains of the Golden Gate Council. There is such comfort in belonging to a larger organization. The Golden Gate Council runs 10 hostels in Northern California, each a unique character on the landscape, and our hostel is the most remote and the smallest (Redwood Hostel has about 5,000 overnights; San Francisco Downtown Hostel tops 70,000!) We all depend on the council's central staff and board of directors to pay bills, approve budgets, develop educational programs, market the hostels, manage our websites, communicate with other councils and the larger Hostelling International network, manage human resources (health benefits, hiring documents etc. ), and in general to keep us afloat. Given our beautiful location, hostellers often exclaim, "You're just SO lucky to have this dream job!" But the reality is more complicated, as anyone in the hospitality industry can tell you. It's fairly inevitable that after some weeks or months, you begin to take the "beautiful location" for granted and eventually, the sea is just a sea. And when that happens, it's tough to share hostellers' giddy enthusiasm with an honest excitement of your own. To top it off, we also live where we work. So, how do we live and work in the same "beautiful" place without watching our sanity, or at least our marriage, go beyond the brink? Hostel managers are a special breed, and we need each other. For that reason, I'll skip the usual words of generic "Management Wisdom" and share a few thoughts on the unique conundrums faced in the hostelling world. These thoughts are a work in progress and have been developed, mostly, after a series of events beginning with my "going it alone" full force into unknown territory … and ending with my stumbling face first into failure and finally asking for help from a colleague, a supervisor or staff, a book, a husband, or the wise inner voice I usually ignore. True, there are some areas of hostel management that I've sailed through without much mishap. But what's the fun in recounting that? 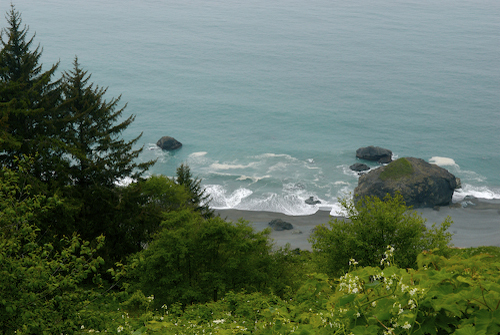 1) "Why yes, the ocean and the redwoods are most definitely utterly and truly amazing," I tell the hosteller — without adding, "although I've been stuck inside this office for 10 hours and haven't gone on a hike in four months!! "The moral of this story? Get out there and enjoy the show. The longer we live in our daily worlds, the smaller those worlds become until sometimes, hours or even days can pass when we've thought about nothing but work and …work. People have come to this hostel for a reason, haven't they? Seek what they're seeking. And don't believe that just because you've lived here for 6 months or 6 years that you have experienced everything there is to experience. You haven't.2) The truth: if you are physically on hostel property, you are working.Nobody can work 24 hours a day, 7 days a week. But if you're always at the hostel, you will indeed be working around-the-clock because, as the manager, you are always "on." It's the rare bird who can be on-call all the time for extended lengths of time. Perhaps you're only managing for a short stint and in that case, fine. But if you like your job and want to stick with it for years, then you need to know when to stop working. And that means leaving the hostel property, whether it's taking a 20-minute walk before work or entrusting your well-trained staff to take over for the weekend. If you live in cell-phone territory, tell your staff to call only if they can't work it out themselves. Entrust others to take responsibility and they will take it.3) Don't work weekends.It might seem appropriate to work weekends, when the bulk of hostellers pass through. It also seems nice to work evenings so you give a personal greeting to every guest. I tried this for two years. I worked Saturday through Wednesday, and then tried to take my "weekend" on Thursday and Friday. I had not yet learned the lessons of #2, and so I would usually be at the hostel during my "weekend" when the National Park superintendent dropped by for a chat, or when the repairman finally arrived to fix the water heater. Or when anyone else with a regular workweek needed to talk to the manager (and nearly everyone who needs the manager is working a regular workweek!). If I had managed to leave the hostel for the afternoon, or was working the night shift, all those weekday/daytime callers would get a bit disappointed that I "wasn't around," paying no heed to the fact that when they took their well-deserved weekend, or went home before sunset, I would still be working. I felt guilty, and eventually bitter towards them for not understanding my work schedule. Yet how could they understand? The hospitality industry is topsy turvy. We rest when they work. We work so they can rest. This year I finally caved in and changed my workweek to Monday through Friday, 8 a.m. to 4 p.m. And because I work in the hostel office five mornings a week, I get to greet people with a pot of coffee and some tried-and-true hiking advice. And that's enough. 4) Interacting with hostellers can help you reach NirvanaSometimes I don't want to be standing at the front desk, answering a question that I've been asked 332 times. Sometimes I don't appreciate the caller who, having just told me they've decided not to stay at the hostel, has kept me on the phone giving travel advice for the past 10 minutes. Sometimes hostellers are rude, or messy, or ask questions that are too pointless or too personal. When this has happened, say, when I'd get stuck behind the counter with a loquacious hosteller, I used to believe there were two options: a) Put on my fake "I'm soooo interested in this" facial expression while mentally cursing them, or b) Start doing work to give the hint that I'm busy. But there is a third option: patience. 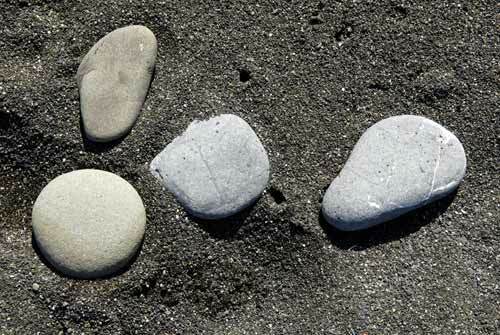 Patience is the "pause" before you allow frustration to get to you. It's the small peaceful feeling that, if held onto, lets you sit with this moment just as it is. It's the feeling that says, "Sure, there are other things I'd rather be doing at this moment. But I'm here. And I'm okay with that." 5) Marriage counseling works.Relationships are a constant process of learning about, challenging, accepting and embracing the perfect/imperfect person you've chosen to share your life with … and then repeating that cycle with yourself. It's hard work. If relationships are tough, now try working together while raising a child, all the while trying to reach consensus on every decision. Quite the recipe for a long string of arguments that have little to do with who's right and who's wrong, but rather the messy result when two separate minds try to act as one. It doesn't work that way. It took Ryan and I too long to appreciate the other's opinion as separate, but truly equal. If you are managing a hostel with a loved one and find yourselves butting heads on a regular basis, then it may be wise to seek objective help from the outside. A bickering couple does not a happy hostel make. My apologies if this advice sounds so well-assured, as if I dance through my day on grateful little tippy toes, always setting clear boundaries and being patient and all that. Nah. I still flop and flail my way through half the day -- but that's just the half of it. As a wise, imperfect Beatle once sang, "It's getting better all the time..."
If you have thoughts for making it better all the time, share them! After all, we do need each other. 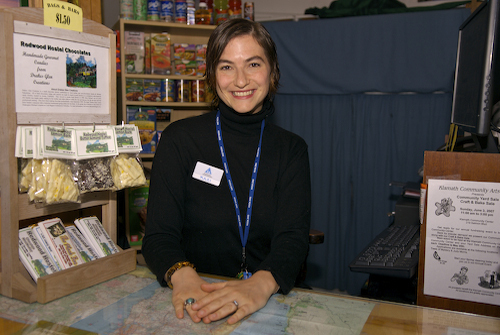 Kaci Elder manages Hostelling International-Redwood National Park. In 2007 the hostel was ranked the No. 1 worldwide in customer satisfaction ratings in the Hostelling International network.